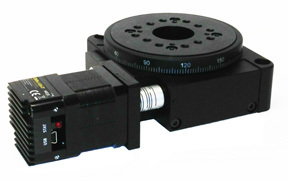 The RTLA-30-100-SMART rotary stages provide accurate positioning performance in a low profile and compact footprint. They are perfect for the confines and requirements of the laboratory and are also applicable for use in manufacturing environments. These stages are ideal for optics, measurement, alignment and other demanding applications. The RTLA-30-100-SMART rotary stages incorporate a precision worm-gear drive mechanism and bearing components for accurate positioning performance over the lifetime of the product. They are motorized with SMART motor/encoder combination and can be controlled in closed position mode offering high resolution and multi-axes daisy-chain operation, with increased speed and high-speed torque. Compact in size, with only 100x100 mm footprint, RTLA-30-100 has center aperture 30 mm and low profile 45 mm. Choices of worm gear ratios 180:1, 90:1, 45:1 are available to achieve 30 rpm rotation speed and translated resolution of 1.8 arc-sec. RTLA-30-100-SMART rotary stage can easily "talk over" USB 2.0, RS-232, RS-485, Ethernet and CAN communications interfaces and comes with powerful yet easy to use software packages for system start-up and integration, like communication drivers, linkable DLL libraries, National Instruments Labview drivers and VI examples, GUI and easy-to-use DXF conversion software. The RTLA-30-100-SMART rotary stage is a member of the Compact Positioning Stages family of linear, rotary, XY and vertical lift stages. Two or more stages can easily be mounted together in numerous combinations using adapter plates and brackets. No need to daisy chain multiple axes, just plug USB cables into USB hub and control unlimited number of axes with a GUI. for system start-up and integration, like communication drivers, linkable DLL libraries, National Instruments Labview drivers and VI examples, GUI and easy-to-use DXF conversion software.